Learning a language is hard work and keeping it going can be a challenge. As the saying goes – if you don’t use it you lose it. I started French at school in the UK when I was 11 and have managed to keep it going, helped by 3 years in Geneva in the early 70s and 4 years in Paris in the late 90s, ever since. In Canberra I belong to a group called Accueil which meets once a month to speak French over lunch. We take it in turns to host and everyone brings a sweet or savoury dish. This inevitably results in a spectacular spread. 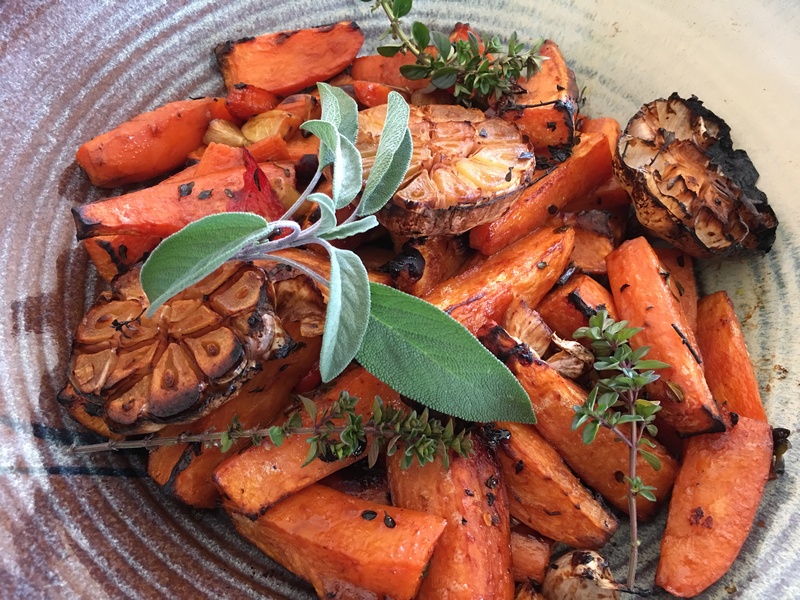 Last month Gabrielle brought a delicious sweet potato dish from one of my favourite chefs Yotam Ottolenghi. Since then I’ve made the recipe three times – the first time with sweet potatoes, the second time with carrots from the garden and the third time with a mixture of the two. They were all delicious. A bottle of Angostura Bitters has been sitting in our drinks cabinet for years. Apart from an occasional dash in a gin and tonic or a splash on top of a pisco sour it rarely sees the light of day. It’s probably been there for a decade, but having made this dish three times I had to buy another bottle. Any good liquor store should stock it. Ottolenghi serves the sweet potatoes sprinkled with goat’s cheese, but I think it’s perfectly nice without. Place orange juice, brown sugar and vinegar in a small saucepan. Bring to the boil then boil steadily for about 20 minutes or until reduced to one cup. Add Angostura Bitters, oil and salt. Preheat oven to 200°C. Peel sweet potatoes and cut into thick wedges – see photo. Place in a bowl with the chillies, herbs and garlic. Pour in the orange juice mixture and mix well to coat, then spread out over a shallow baking tray lined with baking paper if liked, to make the washing up a bit easier. Bake for 50-60 minutes, turning the vegetables every 15 minutes or so. The sweet potatoes should be nicely glazed all over when done, so if they are looking a bit dry add a dash more orange juice or water to the pan. Serve warm or at room temperature, sprinkled with goat’s cheese if using and garnished with some fresh herbs. This entry was posted in Recipes and tagged easy, family, party food, quick, vegetables, vegetarian by Linda Peek. Bookmark the permalink.